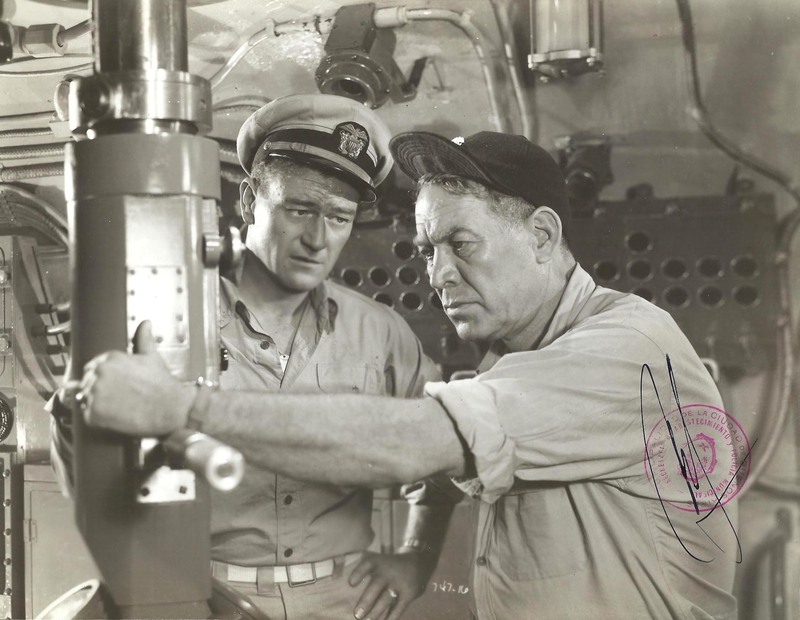 There’s a delicious meta moment in the 1951 drama, Operation Pacific, a film that mostly takes place on a submarine during WWII. It’s amazing what Hollywood can do with a lot of things – and we mean that in two different ways. Operation Pacific, itself, is a study in Hollywood both underperforming and excelling at the same time. Our opinion: This film has an unspectacular script, likely the result of Studio Meddling. (Oh yeah, we’re looking at you, Warner Bros.) It’s a shame because this film is based on actual events, namely: How to Make Better Military Equipment During A War. This subject isn’t given the treatment it deserves because a ridiculous romantic triangle is wedged into the middle of things, and it doesn’t work, despite the presence of the fabulous Patricia Neal. 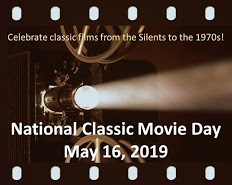 Operation Pacific has everything going for it: Bert Glennon‘s cinematography, Max Steiner‘s score, a top-notch cast…but for that blasted script. This is why you need a John Wayne, someone with a personality so big it spills over the screen and onto the floor. This is a person who knows how to make a movie. Now, perhaps you’re thinking we’re overselling John Wayne’s contribution to the motion picture industry, and you may be right. However, there’s a reason why John Wayne is, well, John Wayne. This is John Wayne talking, the hero of the story, the one who’s gonna bring down the entire Japanese navy. Yet, he expresses awe for these women and makes you believe he’s never seen anything so courageous in his life. Wayne’s crew has just sunk a Japanese submarine. The ensign (Martin Milner) is overjoyed he finally gets to See Something Like This, but Wayne’s steely-eyed look reminds him (and us) that the death of those men is not to be celebrated. Wayne says nothing, yet we know exactly what he’s thinking. In this way, he becomes the Conscience of the movie. One last thing: We’ve always thought Wayne to be a good Movie Listener. He seems to absorb what the other actors are saying; he’s not just waiting for his turn to talk. In one scene, Neal gives Wayne a terrific Please-Get-Lost speech, and we’re anxious to see Wayne’s stoic but heartbroken reaction. But it’s his Listening that lends gravity to Neal’s position. This is important because, earlier in the film, Neal’s superior officer suggested she give up nursing to be a Wife. In the final analysis, we can’t fully recommend Operation Pacific. However, we urge you to see it if you’ve always wondered why people consider John Wayne a Big Deal. Operation Pacific: starring John Wayne, Patricia Neal, Ward Bond. Written & directed by George Waggner. Warner Bros., 1951, B&W, 111 mins. 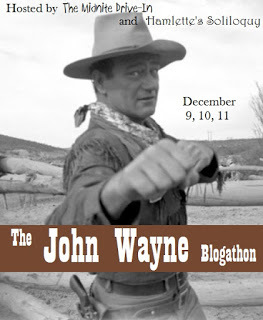 This post of part of The John Wayne Blogathon hosted by The Midnite Drive-In and Hamlette’s Soliloquy. Click HERE to see more fab entries! Previous Announcing the O Canada Blogathon 2017! Next Want to be a Film Noir Aficionado? Start Here. I love your line about there’s a reason John Wayne is John Wayne. In my younger years I simply accepted his greatness, but in more recent times I appreciate it. I never thought about it that way before, but I’ve always taken John Wayne’s greatness for granted. It wasn’t until I started analyzing the “why” of his screen presence that I began to appreciate it, too. I have this sitting on my shelf in a John Wayne collection, but have never seen it. I want to now…to watch for that listening you talked about. That is something I never thought of before. It’s taken me some years to warm up to John Wayne, but the more I see him, the better he seems. I used to discount his acting and think of him as an action guy, but the idea of him listening brings a new dimension. I really do think he’s a good listener. Now, it may be that he’s doing a bit of scene-stealing at the same time…? I’d never really though about this but now that you mention it…yes, I think he is a good listener. Great post by the way! Thanks! Maybe John Wayne’s listening style is a way to draw attention to himself, but he’s still portraying Active Listening. It looks respectful to the other actors on the screen, would you agree? Absolutely agreed. And very noticeable now that I’m aware of it. This is actually one of my favorite John Wayne movies, not because it’s a great movie, but because Wayne himself is great in it. He gets to do more than be Tough in this one — there’s quite a bit of emotional complexity for him to work with, what with an ex-wife he still loves, a baby that reminds him of the son he lost, and then losing his best friend — there’s some really great stuff here. I agree. There are some tangled relationships here and John Wayne is believable in every way. This movie, I’m sad to say, wouldn’t be lost without him. I’ve always had trouble with the Duke in a romantic lead “The Quiet Man” is an exception. John Wayne was always best when he was slinging guns for slinging fists. The war movies suffered mainly because there was a lot of criticism against him for not serving in the actual fighting, but i still like the war movies. Good review. Thanks for hosting this marvelous tribute to the Duke! Wayne was very good with his female leads. He had a gentle side and tenderness that came out in his scenes with strong women characters. You see that here with Neal in a relationship that foreshadows his relationship with Neal in IN HARM’S WAY (1965) 14 years later, also a WWII movie set in the Pacific. They’re both a bit older and been around the block a bit. It’s an adult relationship in the best sense of the word. It would be interesting to see the films back to back and compare the relationships. He and Neal had great chemistry. Too bad they didn’t make a western together. Contrast Wayne with Kirk Douglas who often had abusive relationships with women onscreen. He’s also in IN HARM’S WAY, but plays a dissipated officer who rapes a young nurse who later kills herself. I can cite other examples from Douglas movies, but I’ll leave it at that. Yes, I love the John-Wayne-Patricia Neal pairing in “In Harm’s Way”. You’re right when you say it’s a grown-up relationship. As for Kirk Douglas in that film, I intensely dislike his character, which means he did a good job. I love your comments about how John Wayne listens in his movies. It’s something I’ve loved about him, but never put into words before. This was a great write up, and I really need to see this one, particularly as I love submarines. I’m sure I saw it when I was a kid, but I have no memories of it anymore. I hope you get the chance to see it. Most people seem to like it more than I do, but either way, John Wayne is worth it! Ah yes, a lot of people are turned off by his politics. But it would be interesting to hear your thoughts if you did decide to watch this, or another one of his films. Am afraid I don’t know about the Chiachi situation, but maybe that’s a good thing…? It was a poor attempt at humor. Chiachi (Scott Baio) was one of the “big names” that spoke at the GOP convention last summer.